Is there a lawyer available to help Mr. Carmelo Garcia on the law regarding slander? Mr. Garcia showed up in public portion with what appeared to be his lawyer. Here he begins his remarks in public portion to the City Council with an attack on Da Horsey and alleges the appearance of harassment "as he normally does in his coward ways," before he was stopped by the Council President from continuing in that line of attack. Garcia would later morph into a bad imitation of Rev. Al Sharpton knowing full well his demands and credibility are not at zero but below zero. Later in the New Business portion, Councilman Michael Russo would allude to similar baseless charges. Is attacking a citizen horse going to garner more votes for Assemblyman Ruben Ramos? The Carmelitos in attendance spoke, some markedly improved in polite language and demeanor Carmelo Garcia should be given time to present his years old brochure on Vision 20/20 even though the City of Hoboken has yet to receive any Master Plan. Oddly, the Old Guard has no interest whatsoever in seeking a required comprehensive and legal document. There's so many millions of dollars to make on the backs of the poor. If it means ignoring a basic tenet of redevelopment and presenting a comprehensive plan for review, this is one area where the Old Guard camps agree, forget a plan show us the money. Divided on Old Guard candidacies, Council members Michael Russo, Beth Mason, Terry Castellano and Timmy Occhipinti completely agree on one point- approving Vision 20/20 with no scrutiny whatsoever. It's the true shame of our City. Talking Ed Note: After trying to browbeat approvals to begin Vision 20/20, the next attack on Hoboken was to launch a disgraceful "ethnic cleansing" lawsuit. What followed the national ridicule and severe criticism in that legal tactic is a shameless demand for time to present a marketing brochure. The City of Hoboken rightfully needs to protect itself and all the people. Any redevelopment plan would impact the entire town for generations to come and strongly impact services: police, fire, education, etc. The idea there is zero cost to the City of Hoboken is completely baseless. The first place to begin a redevelopment plan is with credible leadership. As it stands, this is most definitely not the case. Recognition is owed first to Mayor Dawn Zimmer for objectively looking at the overall impact of any HHA redevelopment and asking basic questions to properly service the existing safety requirements of the HHA. Then the City Council members should reasonably ask for a Master Plan to evaluate on behalf of all Hoboken's citizenry. This is where the HHA redevelopment needs to start and is sorely lacking and overdue. Thanks to Council President Peter Cunningham and council members Jen Giattino, Ravi Bhalla and David Mello. They have not been cowed into overlooking their fiduciary duties to all the people of our City we call home. As for Da Horsey, the preference here is for slander; if there's a choice, slander is preferred over assault which is preferred over threats to one's home and worse. More on that at a time and place of our choosing. Thank you very much Mr. Carmelo. Correction: The person with Carmelo Garcia was not the attorney Louis Zayas, but a former Chief of Staff to West New York's Sal Vega. It's Daniel Ortega. Now what is Sal Vega's former Chief of Staff doing in a Hoboken City Council meeting? 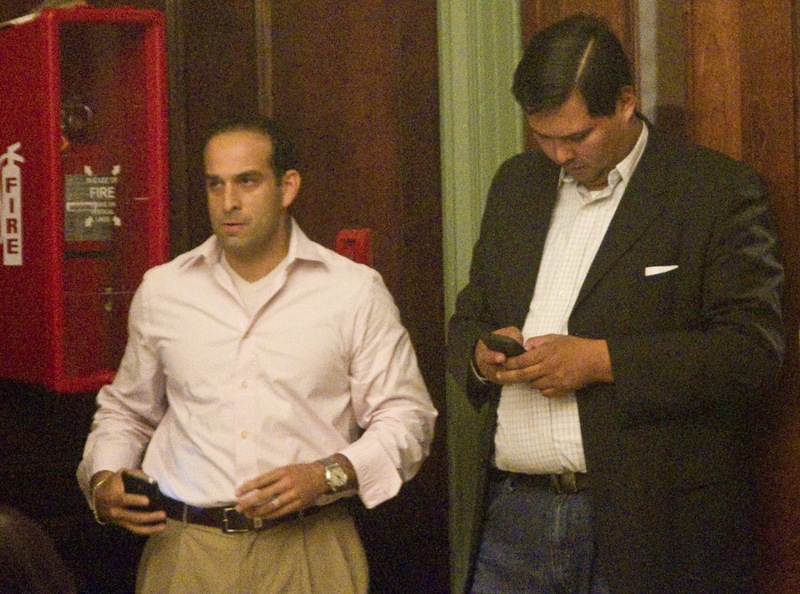 Carmelo Garcia (l) and the former West New York Chief of Staff Daniel Ortega. Ortega worked as Chief of Staff to former West New York Mayor Sal Vega. What's the connection here in Vision 20/20?